For five generations (the 6th just joined us!) our family has been honored to steward this land. Magruder Ranch (also known as Ingel-Haven Ranch) is located in Potter Valley, 130 miles north of San Francisco. In 1918, our family first purchased these 2,400 acres of fertile bottom land, rolling oak savannah hills and rugged chaparral rangeland. Each generation has left its mark, from sheep, to pears, to grass-finished cattle and lamb. Our team is headed by Mac Magruder, whose deep knowledge of this place, the nuance of its seasons, its generosities, and its temperament, guides our management. His daughter, Grace Magruder Farmer, is the voice of the ranch. You'll often find her, covered in pig feed, shovel in one hand and cell phone in the other, arranging logistics the rest of us don't even understand. She recruited her husband, Kyle Farmer, from a vegetable farm. His appreciation of soil health and whole-farm ecosystems is proving an invaluable addition to the ranch. This business wouldn't work, however, without the tireless dedication of our ranch hand of 15 years, Mark (not pictured, he's a bit shy). Whether he's neck deep in a tractor engine or waist deep in an irrigation ditch, Mark's attention to everyday chores keeps this place wired together. Mac's wife, Kate, keeps the team fed, the guests welcomed, and the ever-present cow poop out of the house. 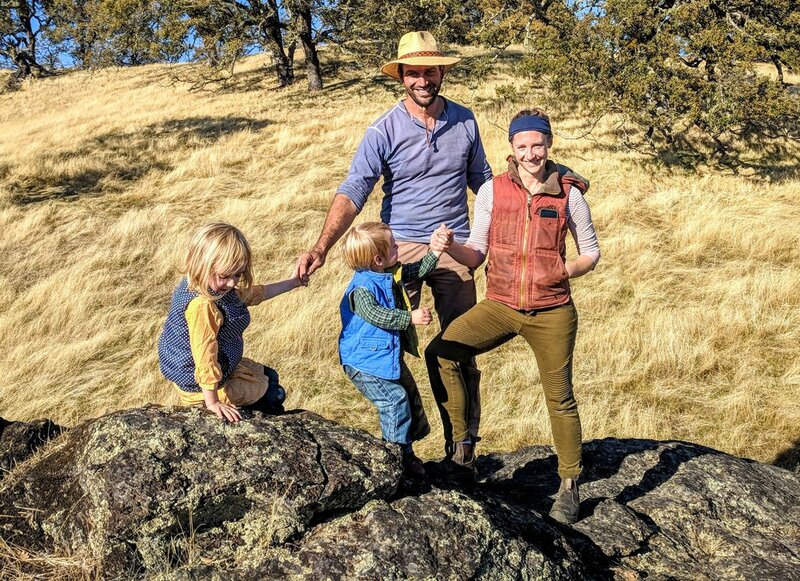 Helen Menasian, Mac's sister and half-owner of the ranch, recently retired from her ten year directorship of the Redwood Valley Outdoor Education Project. We look forward to more of her guiding energy and wisdom. Martha, Grace's sister, is an aspiring actress in Los Angeles. When we're lucky enough to have her up at the ranch, she doesn't hesitate to get her hands dirty. Together, we work to provide healthy, delicious meat to folks who value the care we take in raising our animals. We encourage the managed impact of the animals on the land to support the growth of productive, vibrant pastures and hills. Our personal connection with our customers inspires us to operate with integrity and compassion, demonstrating the utmost respect for all living and non-living components of the Ranch. Ranching is hard work, but working with family is what makes it all worth it. June and Walter, four and two years old respectively, love to accompany us when we head out to check on cows, sheep, and grass. June shows a special proclivity for wildland foraging, and Walter seems eager to surpass his dad and grandpa's skills herding with working dogs.